This ashtray features an iridised dog's head on its polished base. In our books we had speculated, in the past, that Hoffman or maybe Hortensja was the maker. However, the appearance of the exact item in Zabkowice’s 1920 catalogue (below) cleared up the mystery - a confirmed attribution to Zabkowice. Known only in this oval dish 10.5" long and 7.5" wide: the notched edge and motif design are both seen on some Zabkowice items thus the tentative attribution of this unusual piece to that factory. All photos of Golden Square are courtesy of John Hodgson. Zabkowice’s Golden Thistle is found in at least three variations of the surrounding pattern, as well as with variations to the thistle motif itself. Our research into Australian newspaper archives has unearthed some fascinating ads that prove the Polish (Beverly Crystal - Zabkowice) origins. 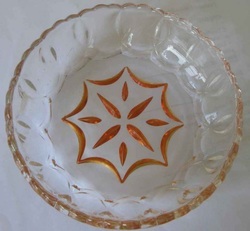 ​The first variation shown on the right has a distinctive, surrounding geometric design – an example has been found bearing the Beverley Crystal Poland label (below). 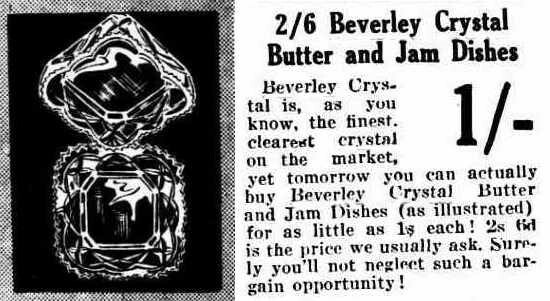 Also below, is an ad from a 1933 Australian newspaper, which shows this exact item, described as a plate or jam dish. These items are just under 5" across. A second variation, shown below, is square and 3.5" across. The ad on the right is from a 1931 Perth newspaper. 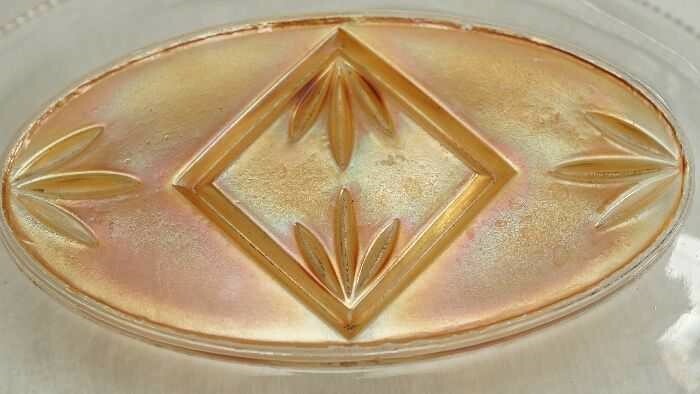 It shows the exact surrounding design on a square jam dish, and confirms that it was made by Beverley Crystal. This further confirms the Zabkowice attribution! ​And here, we have the third variation of the Golden Thistle - it is on an oval dish that has a surrounding “elongated teardrop” pattern identical to that on the Golden Pansy pieces. Based on this similarity we again give a Zabkowice attribution. ​​The surrounding pattern is Zabkowice’s Ring-Around and an example of this unusual item has been seen with a Beverley Crystal Poland label. Both of these features allow us to firmly attribute this to Zabkowice. The single, square-shaped handle is an interesting feature on this dish. is again Ring-Around, confirming the attribution to Zabkowice. It is a very simple, yet elegant design. Photo courtesy of Lesley Smith.